Paul poured out the burden of his soul and exposed the fallacies of the religion of the Athenians. 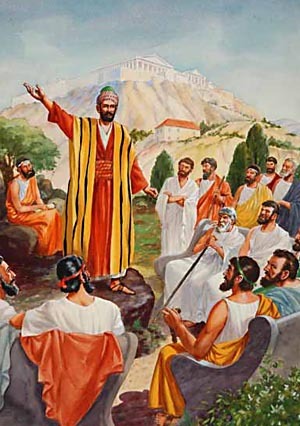 At Berea Paul again commenced his work by going into the synagogue of the Jews to preach the gospel of Christ. He says of them, "These were more noble than those in Thessalonica, in that they received the word with all readiness of mind, and searched the Scriptures daily, whether those things were so. Therefore many of them believed; also of honorable women which were Greeks, and of men, not a few." In the presentation of the truth, those who honestly desire to be right will be awakened to a diligent searching of the Scriptures. This will produce results similar to those that attended the labors of the apostles in Berea. But those who preach the truth in these days meet many who are the opposite of the Bereans. They cannot controvert the doctrine presented to them, yet they manifest the utmost reluctance to investigate the evidence offered in its favor, and assume that even if it is the truth it is a matter of little consequence whether or not they accept it as such. They think that their old faith and customs are good enough for them. But the Lord, who sent out his ambassadors with a message to the world, will hold the people responsible for the manner in which they treat the words of his servants. God will judge all according to the light which has been presented to them, whether it is plain to them or not. It is their duty to investigate as did the Bereans. The Lord says through the prophet Hosea: "My people are [p. 88] destroyed for lack of knowledge; because thou hast rejected knowledge, I will also reject thee." The minds of the Bereans were not narrowed by prejudice, and they were willing to investigate and receive the truths preached by the apostles. If the people of our time would follow the example of the noble Bereans, in searching the Scriptures daily, and in comparing the messages brought to them with what is there recorded, there would be thousands loyal to God's law where there is one to-day. But many who profess to love God have no desire to change from error to truth, and they cling to the pleasing fables of the last days. Error blinds the mind and leads from God; but truth gives light to the mind, and life to the soul. The unbelieving Jews of Thessalonica, filled with jealousy and hatred of the apostles, and not content with having driven them from their labors among the Thessalonians, followed them to Berea, and again stirred up the excitable passions of the lower class to do them violence. The teachers of the truth were again driven from their field of labor. Persecution followed them from city to city. This hasty retreat from Berea deprived Paul of the opportunity he had anticipated of again visiting the brethren at Thessalonica. Although the opposers of the doctrine of Christ could not hinder its actual advancement, they still succeeded in making the work of the apostles exceedingly hard. God, in his providence, permitted Satan to hinder Paul from returning to the Thessalonians. Yet the faithful apostle steadily pressed on through opposition, conflict, and persecution, to carry out the purpose of God [p. 89] as revealed to him in the vision at Jerusalem: "I will send thee far hence unto the Gentiles." From Berea Paul went to Athens. He was accompanied on his journey by some of the Bereans who had been newly brought into the faith, and who were desirous of learning more from him of the way of life. When the apostle arrived at Athens, he sent these men back with a message to Silas and Timothy to join him immediately in that city. Timothy had come to Berea previously to Paul's departure, and with Silas had remained to carry on the work so well begun there, and to instruct the new converts in the principles of their holy faith. The city of Athens was the metropolis of heathendom. Paul did not here meet with an ignorant, credulous populace, as at Lystra; but he encountered a people famous for their intelligence and education. Statues of their gods and the deified heroes of history and poetry met the eye in every direction; while magnificent architecture and paintings also represented the national glory and the popular worship of heathen deities. The senses of the people were entranced by the beauty and glory of art. Sanctuaries and temples, involving untold expense, reared their lofty forms on every hand. Victories of arms, and deeds of celebrated men, were commemorated by sculptures, shrines, and tables. All these things made this renowned city like a vast gallery of art. And as Paul looked upon the beauty and grandeur surrounding him, and saw the city crowded with idols, his spirit was stirred with jealousy for God, whom he saw dishonored on every side. His heart was drawn out in deep pity for the [p. 90] citizens of that grand metropolis, who, notwithstanding their intellectual greatness, were given to idolatry. Paul was not deceived by the grandeur and beauty of that which his eyes rested upon, nor by the material wisdom and philosophy which encountered him in this great center of learning. He perceived that human art had done its best to deify vice and make falsehood attractive by glorifying the memory of those whose whole lives had been devoted to leading men to deny God. The moral nature of the apostle was so alive to the attraction of heavenly things, that the joy and splendor of those riches that will never fade occupied his mind, and made valueless the earthly pomp and glory with which he was surrounded. As he saw the magnificence of the city, with its costly devices, he realized its seductive power over the minds of the lovers of art and science. His mind was deeply impressed with the importance of the work before him in Athens. His solitude in that great city where God was not worshiped was oppressive; and he longed for the sympathy and aid of his fellow-laborers. As far as human fellowship was concerned, he felt himself to be utterly isolated. In his Epistle to the Thessalonians he expresses his feelings in these words: "Left at Athens alone." Paul's work was to bear the tidings of salvation to a people who had no intelligent understanding of God and his plans. He was not traveling for the purpose of sight-seeing, nor to gratify a morbid desire for new and strange scenes. His dejection of mind was caused by the apparently insurmountable obstacles which presented themselves against his reaching the minds of the people of Athens. Grieved at the idolatry everywhere visible about him, he felt a holy zeal for his Master's cause. He [p. 91] sought out his Jewish brethren, and, in their synagogue at Athens, proclaimed the doctrine of Christ. But the principal work of Paul in that city was to deal with paganism. The religion of the Athenians, of which they made great boast, was of no value, for it was destitute of the knowledge of the true God. It consisted, in great part, of art worship, and a round of dissipating amusement and festivities. It wanted the virtue of true goodness. Genuine religion gives men the victory over themselves; but a religion of mere intellect and taste is wanting in the qualities essential to raise its possessor above the evils of his nature, and to connect him with God. On the very stones of the altar in Athens this great want was expressed by the inscription, "To the Unknown God." Yes; though boasting of their wisdom, wealth, and skill in art and science, the learned Athenians could but acknowledge that the great Ruler of the universe was unknown to them. The great men of the city seemed hungering for subjects of discussion, in which they would have opportunity to display their wisdom and oratory. While waiting for Silas and Timothy to meet him, Paul was not idle. "He disputed in the synagogue with the Jews, and with the devout persons, and in the market daily with them that met with him." The great men of Athens were not long in finding out this singular teacher, who presented to the people doctrines so new and strange. Some who prided themselves upon the extent of their intellectual culture entered into conversation with him. This soon drew a crowd of listeners about them. Some were prepared to ridicule the apostle as one far beneath them, socially and [p. 92] intellectually, and said jeeringly among themselves, "What will this babbler say? Other some, He seemeth to be a setter forth of strange gods; because he preached unto them Jesus and the resurrection." The Stoics and the Epicureans encountered him; but they, and all others who came in contact with him, soon saw that he had a store of knowledge even greater than their own. His intellectual power commanded the respect and attention of the more intellectual and learned; while his earnest, logical reasoning, and his power of oratory, held the promiscuous audience. Thus the apostle stood undaunted, meeting his opposers on their own ground, matching logic with logic, and philosophy with philosophy. They reminded him of Socrates, a great philosopher, who was condemned to death because he was a setter forth of strange gods. Paul was counseled not to endanger his life in the same way. But the apostle's discourse riveted the attention of the people; and his unaffected wisdom commanded their respect and admiration. He was not silenced by the science or irony of the philosophers; and, after exchanging many words with him, and satisfying themselves that he was determined to accomplish his errand among them, and tell his story at all hazards, they decided to give him a fair opportunity to speak to the people. They accordingly conducted him to Mars' Hill. This was the most sacred spot in all Athens, and its recollections and associations were such as to cause it to be regarded with superstitious awe and reverence, that with some amounted to dread. Here, the most solemn court of justice had long been held to determine upon criminal cases, [p. 93] and to decide difficult religious questions. The judges sat in the open air, upon seats hewn out in the rock, on a platform which was ascended by a flight of stone steps from the valley below. At a little distance was a temple of the gods; and the sanctuaries, statues, and altars of the city were in full view. Here, away from the noise and bustle of crowded thoroughfares, and the tumult of promiscuous discussion, the apostle could be heard without interruption; for the frivolous, thoughtless class of society did not care to follow him to this place of highest reverence. Around him here were gathered poets, artists, and philosophers,—the scholars and sages of Athens,—who thus addressed him: "May we know what this new doctrine, whereof thou speakest, is? for thou bringest certain strange things to our ears; we would know, therefore, what these things mean." With earnest and fervid eloquence, the apostle continued: "God that made the world and all things therein, seeing that he is Lord of Heaven and earth, dwelleth not in temples made with hands; neither is worshiped with men's hands, as though he needed anything, seeing he giveth to all life, and breath, and all things; and hath made of one blood all nations of men for to dwell on all the face of the earth, and hath determined the times before appointed, and the bounds of their habitation; that they should seek the Lord, if haply they might feel after him, and find him, though he be not far from every one of us." Thus, in the most impressive manner, with hand outstretched toward the temple crowded with idols, Paul poured out the burden of his soul, and ably exposed the fallacies of the religion of the Athenians. The wisest of his hearers were astonished as they listened to his reasoning. His words could not be controverted. He showed himself familiar with their works of art, their literature, and their religion. Pointing to their statuary and idols, he declared to them that God could not be likened to forms of man's device. The works of art could not, in the faintest sense, represent the glory of the infinite God. He reminded them that their images had no breath nor life. They were controlled by human power; they could move only as the hands of men moved them; and those who worshiped them were in every way superior to that which they worshiped. Pointing to noble specimens of manhood about him, he declared, "Forasmuch, then, as we are the offspring of God, we ought not to think that the Godhead is like unto gold, or silver, or stone, graven by art and man's device." Man was created in the image of this infinite [p. 95] God, blessed with intellectual power and a perfect and symmetrical body. The heavens are not large enough to contain God; how much less could those temples made with hands contain him. Paul, under the inspiration of his subject, soared above the comprehension of the idolatrous assembly, and sought to draw their minds beyond the limits of their false religion to correct views of the true Deity, whom they had styled the "Unknown God." This Being, whom he now declared unto them, was independent of man, needing nothing from human hands to add to his power and glory. The people were carried away with admiration of Paul's eloquence. The Epicureans began to breathe more freely, believing that he was strengthening their position, that everything had its origin in blind chance; and that certain ruling principles controlled the universe. But his next sentence brought a cloud to their brows. He asserted the creative power of God, and the existence of his overruling providence. He declared unto them the true God, who is the living center of government. This divine Ruler had, in the dark ages of the world, passed lightly over heathen idolatry; but now he had sent them the light of truth, through his Son; and he exacted from all men repentance unto salvation; not only from the poor and humble, but from the proud philosopher, and the princes of the earth. "Because He hath appointed a day, in the which he will judge the world in righteousness by that Man whom he hath ordained; whereof he hath given assurance unto all men, in that he hath raised him from the dead." As Paul thus spoke of the resurrection from the dead, his speech was interrupted. Some mocked; [p. 96] others put his words aside, saying, "We will hear thee again of this matter." Thus closed the labors of the apostle at Athens; for the Athenians persistently clung to their idolatry, and turned away from the light of a true and reasonable religion. When a people are wholly satisfied with their own attainments, little more need be expected of them. Highly educated, and boasting of their learning and refinement, the Athenians were constantly becoming more corrupt, and having less desire for anything better than the vague mysteries of idolatry. Many who listened to the words of Paul were convinced of the truths presented, but they would not humble themselves to acknowledge God, and to accept the plan of salvation. No eloquence of words, no force of argument, can convert the sinner. The Spirit and power of God can alone apply the truth to the heart of the impenitent. Of the Athenians it may be said, "The preaching of the the cross is to them that perish foolishness, but to them that are saved it is the power of God." In their pride of intellect and human wisdom may be found the reason why the gospel message met with so little success among that people. Our Saviour rejoiced that God had hid the things of eternal interest from the wise and prudent, and had revealed them unto babes in knowledge. All worldly wise men who come to Christ as poor, lost sinners, will become wise unto salvation; but those who come as distinguished men, extolling their own wisdom, will fail to receive the light and knowledge which he alone can give. The labors of Paul in Athens were not wholly in vain. Dionysius, one of the most prominent [p. 97] citizens, and some others, became converts to Christianity, and joined themselves to him. The words of the apostle, and the description of his attitude and surroundings, as traced by the pen of inspiration, were to be handed down through all coming generations, bearing witness of his unshaken confidence, his courage in loneliness and adversity, and the victory he gained for Christianity, even in the very heart of paganism. Inspiration has given us this glance at the life of the Athenians, with all their knowledge, refinement, and art, yet sunken in vice, that it might be seen how God, through his servant, rebuked idolatry, and the sins of a proud, self-sufficient people. The words of Paul become a memorial of the occasion, and give a treasure of knowledge to the church. He was in a position where he might easily have spoken that which would irritate his proud listeners, and bring himself into difficulty. Had his oration been a direct attack upon their gods, and the great men of the city who were before him, he would have been in danger of meeting the fate of Socrates. But he carefully drew their minds away from heathen deities, by revealing to them the true God, whom they were endeavoring to worship, but who was to them unknown, as they themselves confessed by a public inscription. Click here to read the next chapter: "Paul at Corinth"